That's all I got so far. Quite sure I'll be adding more as I go along. Wanted to get this started this week but ran into a bit of a set back when I went out to my shed a realized some low life went in there and stole my miter and table saw along with my tool box. It's ok though. I'm just hoping someone needed it more than I did. I'll find another way to get it done. Stand by for lots of pics. Can't wait to get it started. Cool always like warching new builds. Awesome Well, other than the stolen table saw and miter saw part Not sure I could leave it at maybe they needed it more than me, lol. Do you have plans yet on what you will stock it with? Sounds like you have a good direction. I have the glass holes 700 and it has never failed me. I had to make a couple slight modifications to quiet it down a bit because it is a little loud out of the box so to speak. Four months ago I had to put a lock on my shed for the first time I can ever remember. Caught someone in shed and afterward noticed ladder was gone. No idea if anything else was taken or how many times they had been back but it's locked now. It's sad you cannot just have a reasonable expectation that no one will take the stuff you worked hard for. Times are not like they used to be. I usually don't have to worry about things disappearing. It's fairly obvious if you don't belong on that piece of land and too many neighbors have shotguns. OH Trent, I have plenty of guns. But I don't tend to carry them around all the time. And I didn't see them steal the ladder it was just gone. Then at a later time noticed door open in rain storm and when I went to inspect spooked a guy out. He may have just been looking for shelter but that was the catalyst that forced me to lock up. That's the difference, my neighbors tend to carry their guns around in their yard. Remember I live in Deliverance country. Not sure yet. Rics and acans are my favorite corals so gonna dedicate gardens to those. Fish wise, I have the clownfish from my nano setup but I'm thinking about giving him away and getting some fancy clownfish. Maybe a small dwarf angel and a christmas wrasse. Livestock list is still being worked out based on space. 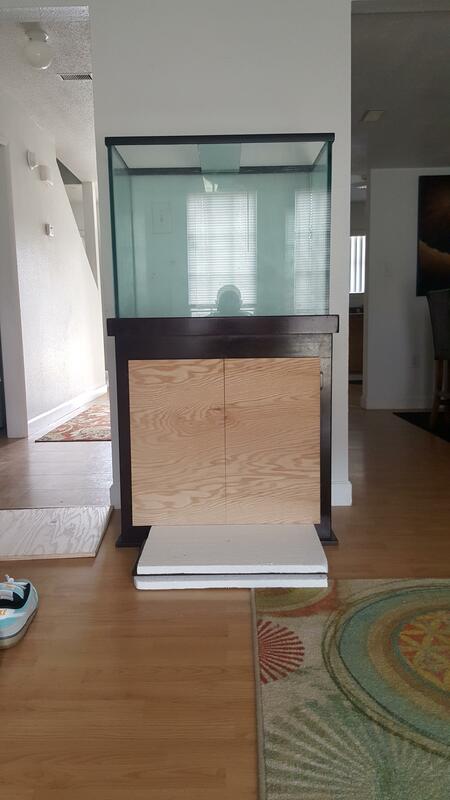 Nice looking tank look forward to the rest of the build. 55 tall leaves options to do a lot better f different coral with the right light because the Rics and zoas don't require a ton and the right rock work gives you plenty of mounting places up high. Still planning to drill this one? New door test fit was a success. Now to get them stained and mounted. That's what I was thinking also. The taller rock work is a little intimidating. I really don't want the tank to have the wall of rock. Gonna be doing a lot of research into some cool aquascapes here in the next couple of days. And yes this tank is still getting drilled. Everything that was part of the original build will be moved into this one. Check to be sure the glass isn't tempered before trying to drill it(polarized sunglasses trick). For some reason I am thinking it might be on that tank. With those big panels in the front and back it would be a good idea to check that before drilling for sure. Thanks for bringing that to my attention guys. I didn't even think about that honestly. I checked the tank today and it's all good. Front nor back is tempered. Glass holes kit should be here today, so will be drilling tomorrow. Got the doors test mounted today. Got a coat of stain on the backs as a trail run. I'm thinking 2 coats each side and a coat of poly should match the existing stain perfectly. Unfortunately have a wedding tomorrow and to work this weekend but hoping to have the tank ready for water on Tuesday. Following, I never had the nerves to drill . Eddgrrr if you ever want to try go a get a few of petco's $1 per gallon tanks. If you get the little $10 one and can drill it, you can drill ANYTHING. That is very thin glass on the 10g, and breaks easy. Those tens are tough to drill from what I hear. I drilled my cube though and it was super easy and didn't take long at all. When you mock up where to put overflow be careful of how high you place it. If you put it all the way to the top you are not going to be able to put much flow through it or it will go all the way to the top of the thing. The water flows into the teeth on mine(same overflow you bought) and I am using a mag 9 and I have it throttled down about thirty percent to give you an idea. 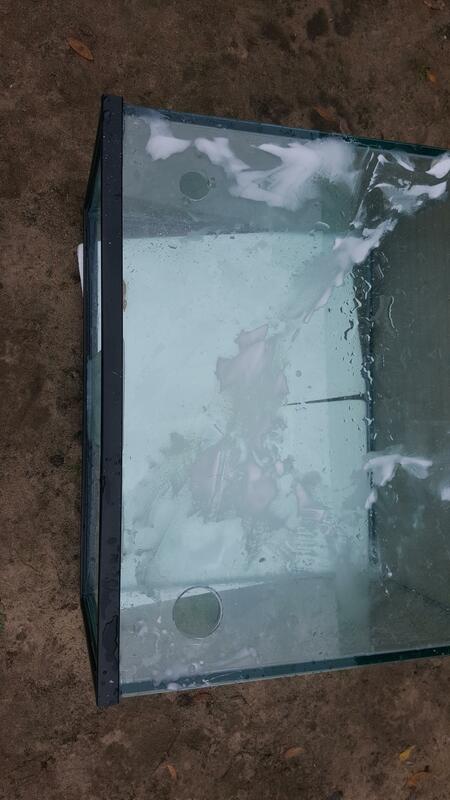 The top of the over flow with the lid is about a half inch below the top of the glass and that puts the waterline about an inch from the top. I never worried about anything with acrylic other than making sure the bit was completely straight on exit so it wouldn't bind. With glass the key is a drill with a clutch and lightening the clutch as loose as it will go so if it does bind the clutch will slip instead of binding and shattering. Then you just have to let the bit do the work and don't press on it. This is where I have the most trouble honestly. 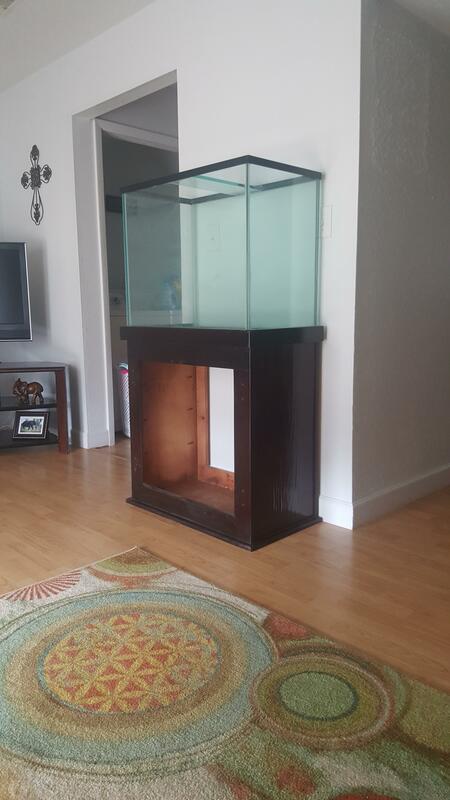 My current tank I put three holes in it and hey we're the first holes I ever drilled in glass. And I was quite scared on the first one and laughing at how easy it was by the time I was done. Got 'er drilled! Couple more coats of stain, plumbing and sump and this baby will be ready to get wet! Is the smaller hole a return line? If so I would just throw out there it looks a bit low so need to have a way to keep that much of the tank draining if power goes out. Sump would have to be very large to accommodate that much drainage when pump goes off.